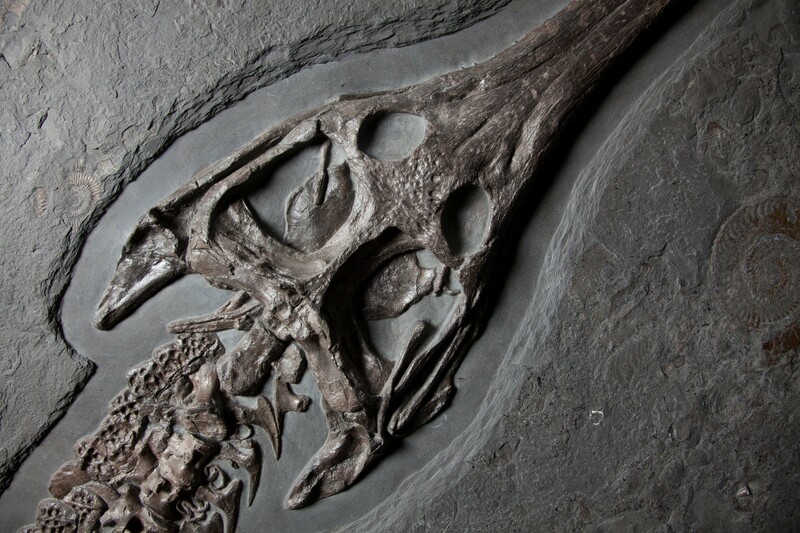 This outstanding fossilised skeleton is that of the ancestral crocodile species Stegosaurus bollensis that lived during the early Jurassic period. The skeleton, complete with armoured plates, has been exquisitely preserved and recovered from the Holzmaden Oil Shale of south Germany. The crocodile was once buried in fine, muddy sediment 195 million years ago at the bottom of the Tethys Ocean, which once existed between Europe and Africa. The calm, deep water provided a rare anoxic (without oxygen) environment, which prevented the skeleton from any significant decomposition before burial. The mud has since been compressed into oil shale, leaving the immense skeleton completely in-tact. This specimen is one of the few skeletons of Stegosaurus bollensis ever to be discovered. We can deduce much about the life of this reptile from the size and perfect preservation of the piece. Similar to present-day crocodiles, we can see that the two front limbs of the Stegosaurus are much shorter than the back two. This indicates that crocodile ancestors were bipedal; indeed, we believe that crocodiles evolved from the the same reptile species as the dinosaurs and airborne pterosaurs. Dinosaurs ruled the lands during the late Triassic and early Jurassic. This made terrestrial life increasingly difficult for ancestral crocodiles, as there were many predators and prey was scarce. However, the seas were rich in fish, shellfish, starfish, crabs, squid… You can even see fossil belemnite guards (bullet shells of squid-like organisms) and the beautiful spiral shells of ammonites preserved around the crocodile skeleton! And so, to exploit this food-rich environment, crocodiles moved into the water. We can tell that the Stegosaurus bollensus species was in the process of adapting to an aquatic environment: it could propel itself through the water with its tail, webbed back limbs and front paddles. 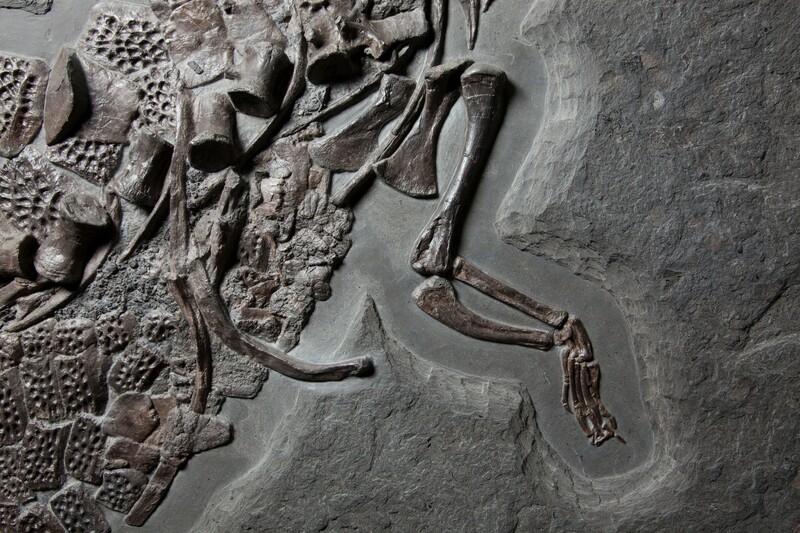 Its fingers were becoming redundant (as a paddle is more effective in water), which explains why the finger bones in the front limbs are particularly short. We can even examine the nostrils on the end of this crocodile’s snout, showing that it still used its lungs and returned to land (or the water surface) to breathe. The elegant toothed snout implies that this crocodile had a diet of fish and crustaceans. To protect itself from sharks, Stegosaurus bollensis evolved to have enlarged scales, imitating armoured plating. The numerous speckled rectangular plates in the specimen have been perfectly preserved in their original positions: on top of the reptile’s back and tail. This vast, rare fossilised skeleton is a beautiful reminder of the success of reptiles during the Jurassic era. Its gentle curve imitates its elegant movement through the water, while the meticulous detail of the armoured plating allows us to understand the ubiquitous threat of dinosaurs and sharks.